Filling the wombat hole with bricks and stones is on thing, but we needed more to stop a wombat dedicated on his mission of making a new nest. Opa looked around his "treasure trove" in the garage and came out with some steel used for strengthening concrete in trenches. These were then cut into lengths and then bent so they would fit between the supports for our under-house storage and go into the ground some distance too. So far so good. The Wombat hasn't been back yet. But it's still early days. 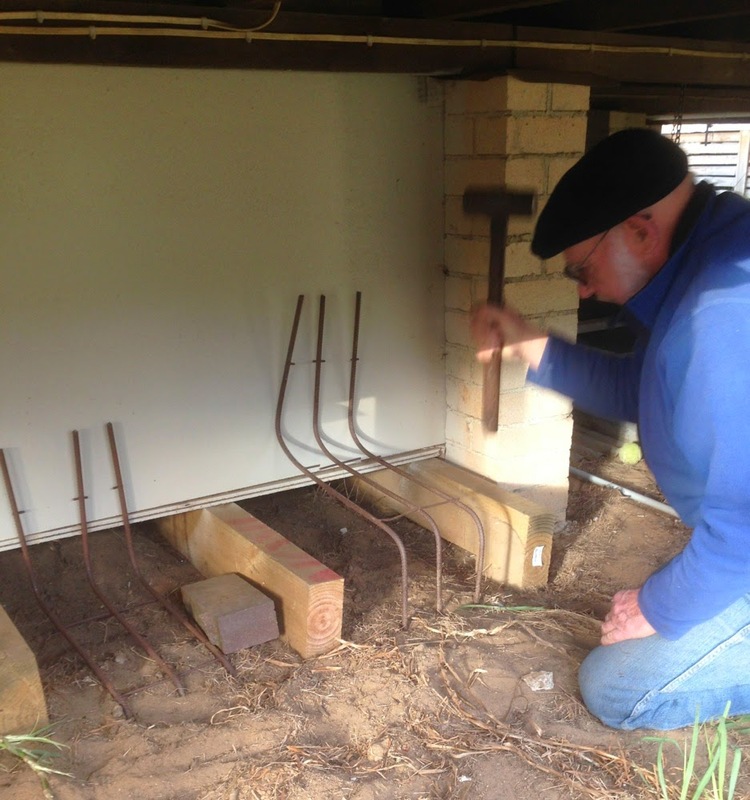 We'll see how well our wombat defences hold up if the wombat gets really determined! Once more it is cooling down in the evenings so we need to light the fire. "I think we need a bit of kindling," I said to James. He gathered up Rose, Martin and Zach and they went for a walk among the nearby trees. Eucalyptus/gum trees are notorious for dropping leaves, twigs and branches all year round making a superb fire hazard around their bases. This works out fine during Winter when we can perform this community service, reducing the local fire hazard whilst gaining kindling to start our fires. 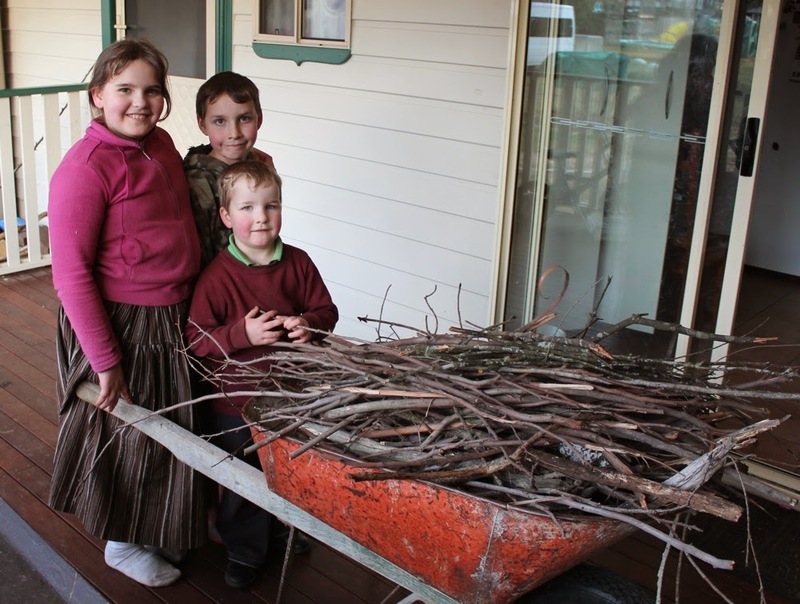 Dried gum tree branches are great for starting fires. A short time later they returned and showed me their "little bit of kindling". "Yep," I said, "That should do the trick." Last night a wombat decided he had found the perfect place for a new hole. Unfortunately it was under our house. Zach discovered the new hole early in the morning with lots of fresh dirt and called over Martin so they could play in it together. Then Rose popped over to see what they were doing and realised this large hole under the house needed some adult attention and called Opa. 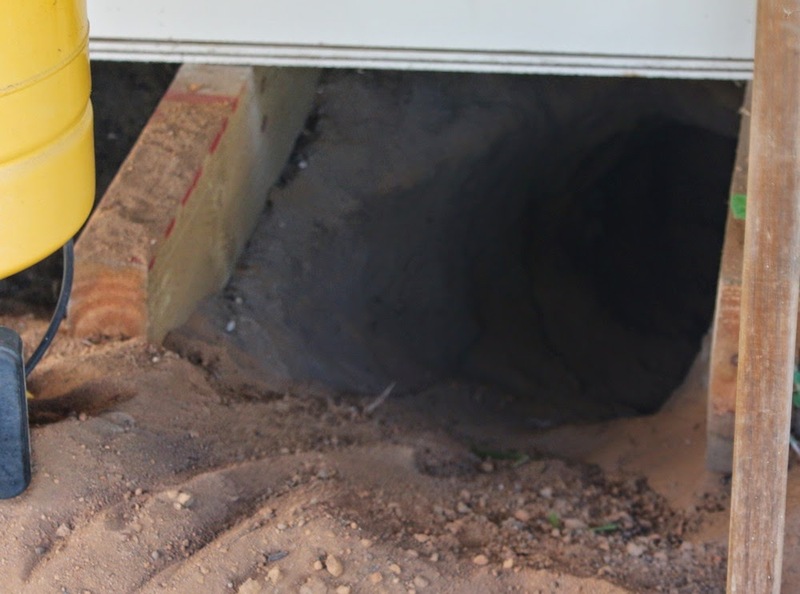 The wombat had dug around 6 foot into the dirt around the foundations of one end of our house. 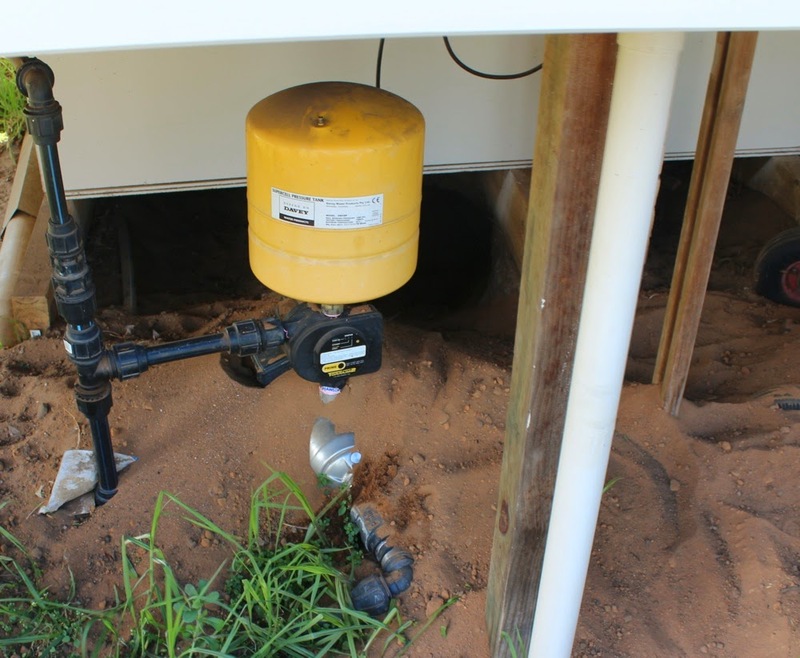 The pump for our water was covered - which is not good. James did mention the pump sounded funny when he had a shower this morning. Being covered in dirt does that kind of thing. So we have now filled in the hole with a variety of bricks and stones and put up a strong mesh to make the whole process more of a challenge. We have lots of wombats in our area. They are nocturnal and like going from point A to point B. If something is in the way, they just dig under or around it and continue on their nightly trek. 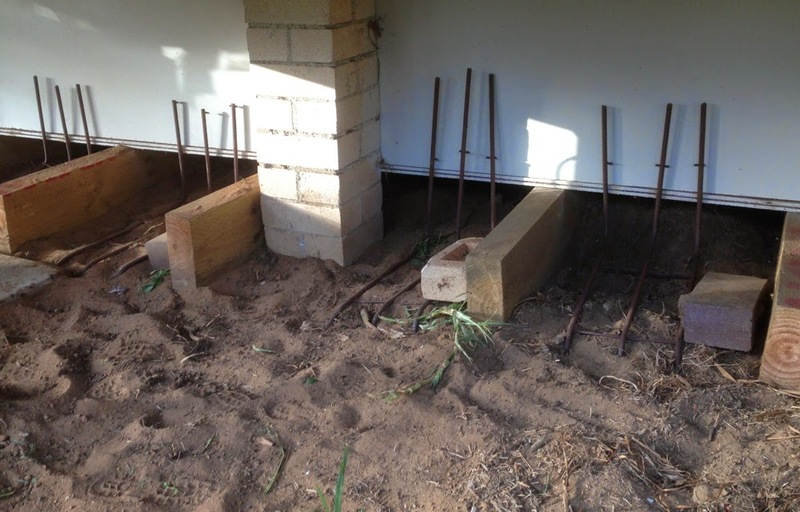 Often you can see old houses in wombat areas with collapsed corners as their foundations have been dug away. This is just one of those benefits of living in the country. Now that he has his driving licence, Eric needed something to drive. By a great stroke of fortune, a relative of a friend had upgraded her car and was able to sell Eric her old one for only $450! It is roadworthy and runs well. The paintwork may not be premium but who cares? It is a first car and no finance was needed. Well done Eric. But cars come with other costs. Insurance (3rd party which covers damage to other vehicles and property) costs about $300 a year. Registration and compulsory insurance (which covers damage to other people) will probably come in at around $900 a year. And then general maintenance and other running costs. Luckily he is a clever fellow and has a knowledgable Opa and father of a friend who can help him with car maintenance. Now he can be free (er). Eric has passed his driving test and now has his P (Probationary) plates. He has now gained another independence step, freeing him from the vagaries of public transport. At least that will be the case when he gets his own car. 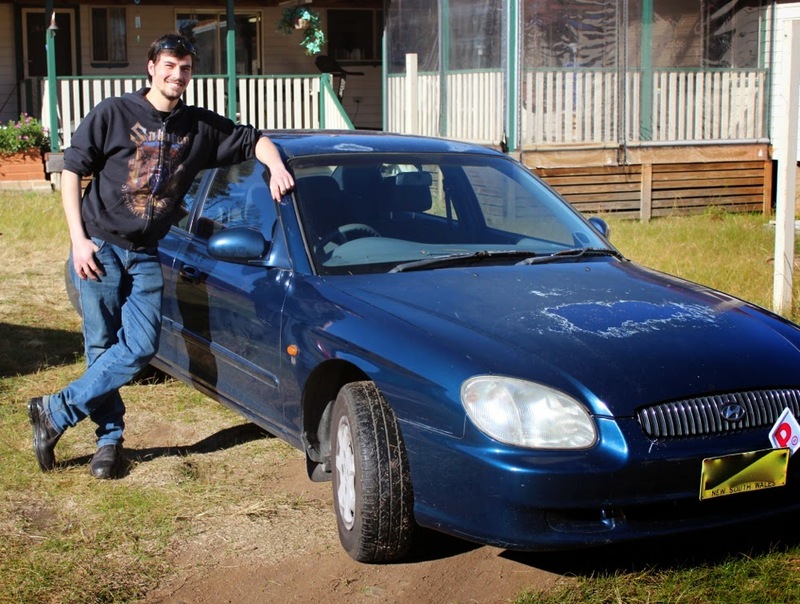 In Australia, learner drivers need to pass a knowledge test, then accumulate 120 hours of driving experience (including 20 hours of night time driving) over a minimum of 12 months and then pass a driving test with close to 100% success. 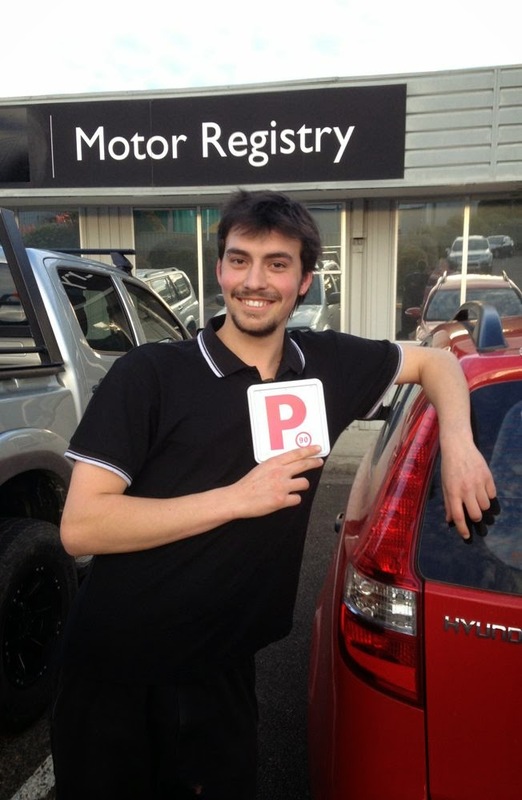 The resulting Red P plate has some limitations, moving to the green P plate after at least a year and then finally a full license at a minimum of a year again. So from the time of passing the Learner Driver test, it is at least 3 years before you become a fully licensed driver. We have two children through so far. The next is about to take his test and then we have another 15 or so years of learner driving as we go through the remaining 5 children. I am very glad that Lana's father is around to help with the driving load!